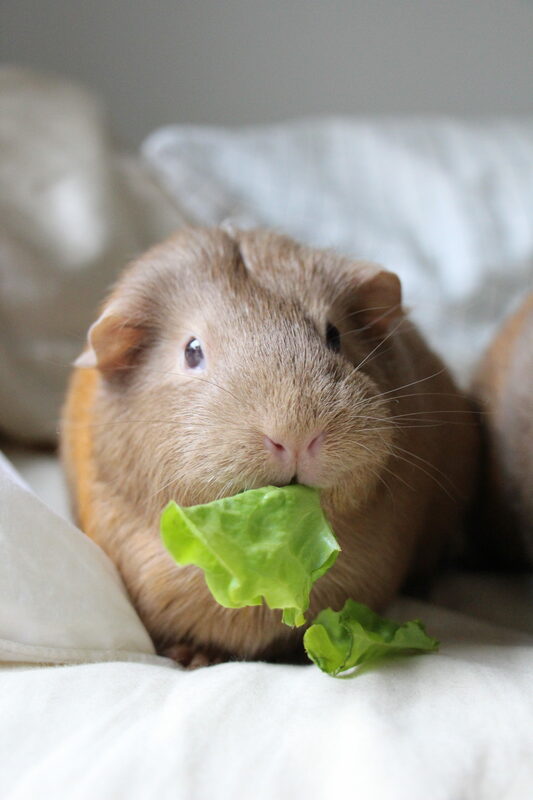 What can my Guinea Pig eat? Guinea pigs can eat a huge variety of fruits, vegetables, herbs and other plants. Hay is an essential in your guinea pigs diet as it provides the much needed fiber, protein and roughage that a healthy guinea pig requires. Timothy hay is a great hay to supply for your guinea pig as it contains the right balance of fiber, protein and carbohydrates and can be eaten throughout all stages of a guinea pigs life. Fresh grass is a great food for a guinea pigs diet as it can be consumed in large amounts and is great for their digestive system. When selecting grass for your guinea pig you should select fresh grass that you know hasn’t been sprayed with any chemicals. Lawn clippings should never be given to your guinea pig in substitute for grass. Pellets are an addition to your guinea pigs diet, however not all pellets marketed towards guinea pigs are suitable for their diets. When choosing a pellet for your guinea pig look for something that is timothy hay based instead of alfalfa, and ensure there are no nuts or seeds in the mixture. Fresh vegetables may be fed to your guinea pig daily, however fruits should be treated as treats and fed sparingly. One cup of fresh fruits and vegetables is allowed per guinea pig per day as over consumption of vegetables and especially fruits can cause diarrhea. Below is a list of several fruits, vegetables, plants and herbs that guinea pigs enjoy eating as well as a list of toxic foods for guinea pigs. While vegetables are an important staple in a guinea pigs diet, not all vegetables are suited for daily feeding. All new foods should be introduced gradually and in small amounts to prevent digestive problems. Guinea pigs should be allowed one cup of fresh veggie per pig per day and all vegetables should be served raw. Cabbage – Feed sparingly as excess amounts can cause gas and bloat. Capsicum – Also known as bell pepper, red capsicum is one of the best ways for your guinea pig to get vitamin C. Can be fed daily. Celery – Chop stem into small pieces to prevent choking. Rich in calcium so should be fed in small amounts, or none at all to guinea pigs prone to bladder infections. Corn – Fresh corn as well as its husk can be eaten but don’t allow your guinea pig to eat the cob. Tinned or frozen corn can not be used. Tomato – Both large and cherry tomatoes are safe but should be fed in small amounts to prevent mouth sores. The plant however is poisonous. Fruits should be considered a treat for guinea pigs and should be fed in small amounts. Over-consumption of fruits can cause weight gain, diabetes, diarrhea and other health issues in guinea pigs. Banana – Rich in sugar and should be fed rarely. May cause constipation and should not be fed to guinea pigs with diabetes. Cherries – Feed in small amounts with pit removed. Grapes – Feed rarely, removing skin, leaves and stems. Kiwi Fruit – Rich in vitamin C but can cause mouth sores. Feed rarely. Pear – Rich in sugars and may cause constipation. Feed in small amounts as a treat. Basil – Provided fresh but feed sparingly. Your guinea pig will enjoy foraging and munching on the stems and leaves you might find in your backyard. Ensure you correctly identify the plant before giving it to your guinea pig to eat and only feed them fresh plants that you know haven’t been sprayed with chemicals. All plants should be washed and pest free before being provided to your guinea pig. Frozen Vegetables – guinea pigs should consume their fruit and vegetables in their natural state. Caffeine – This includes coffee, teas, energy and soft drinks. While some teas don’t have caffeine, it’s best not to give your guinea pig anything they would not naturally eat. Processed Foods – This includes all pre-made, cooked and processed foods. Your guinea pig should only be eating hay, water, pellets and fresh fruit and vegetables. Your guinea pig should always have access to fresh hay and water. Do not add anything to your guinea pigs water. Vitamin C drops or powers marketed towards rodents and guinea pigs are not to be used in their water as not only can it deter them from drinking, but Vitamin C is water soluble and will degrade rapidly once introduced to water. Fresh fruit, vegetables, hay and grass have all the nutrients that your guinea pig needs. 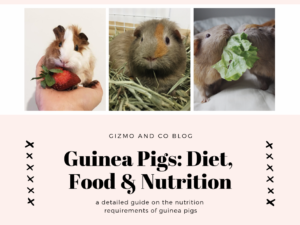 Follow this link for more information on guinea pigs diet and nutrition.